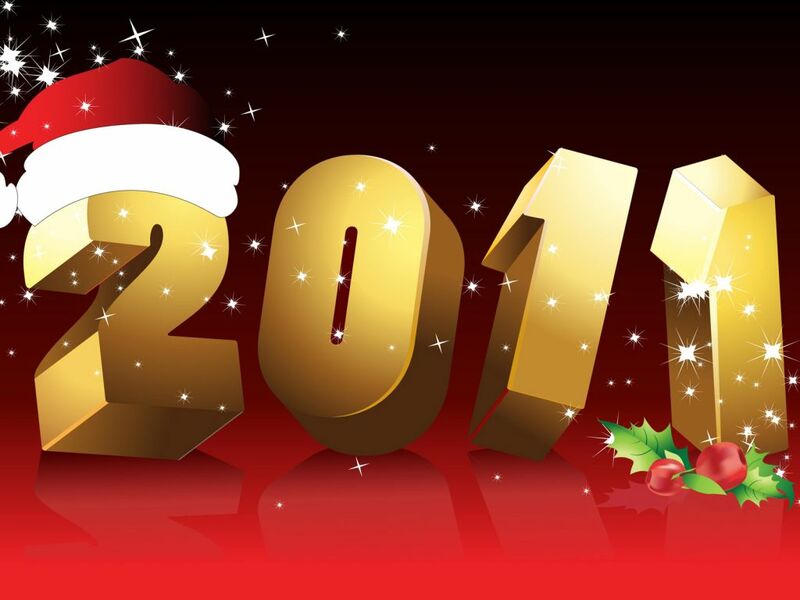 Just before we begin to bring in the New Year you may want to take a look at Father James Martin's piece at the Huffington Post. There's a lot to learn in this post whether you're planning on making New Year's resolutions or not. For a lark yesterday, on my 50th birthday, I Tweeted 12 things that I wish I had known at 25. Or more accurately, 12 things that, had I put them into action, would have made my life a lot easier. Some are bits of advice that wisdom figures have told me and took years to sink in. Others are the result of some hard knocks. A few are insights from the great spiritual masters that I've adapted for my own life. Maybe a few will help someone you know who's 25. Maybe one or two will help you. 7. Don't worry too much about the worst that can happen. Even if it happens, God is with you, and you can handle it. Really. 8. You can't force people to approve of you, agree with you, be impressed with you, love you or even like you. Stop trying. 9. When we compare, we are usually imagining someone else's life falsely. So our real-life loses out. I.e. Compare and despair. 10. Even when you finally realized the right thing, or the Christian thing, to do, it can still be hard to do. Do it anyway. 11. Seven things to say frequently: I love you. Thank you. Thank you, God. Forgive me. I'm so happy for you! Why not? Yes. 12. Peace and joy come after asking God to free you -- from anything that keeps you from being loving and compassionate. Busted Halo's Fr. Jack takes on tourists in Times Square to ask people what New Year’s resolutions are going to be this year, what feast the Catholic Church celebrates on January 1, and if anyone knows about the biggest resolution ever made in all of human history. And I pray that the New Year will find us growing together in holiness, health and happiness! "Dear friends! Know that the Pope loves you, carries you in his heart, brings you all close in a fatherly embrace and prays for you. Every wish for a Merry Christmas! Thank you for wanting to share the joy of these feast days with me. 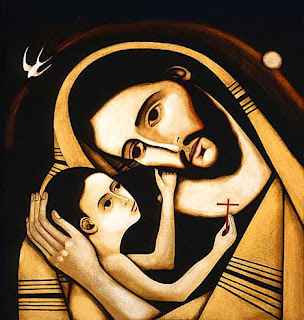 I call upon the maternal protection of the Holy Family of Nazareth who we celebrate today -- Jesus, Mary and Joseph -- and I bless all of you and your dear ones." This Sunday we celebrate the Solemnity of the Epiphany of the Lord. Spend some time this week reading, pondering and praying over the Scriptures for this coming Sunday's liturgy for EPIPHANY. There's no better way to prepare for celebrating the Eucharist than to study the Word you'll hear proclaimed on the Lord's Day. The first reading, from the prophet Isaiah, proclaims how the faith of those who worship in Jerusalem will draw all peoples to itself. You'll see the influence of this pericope on the Gospel from Matthew. He is the only evangelist to give us the story of the Magi. The Apostle Paul, writing to the Ephesians, echoes the same message. 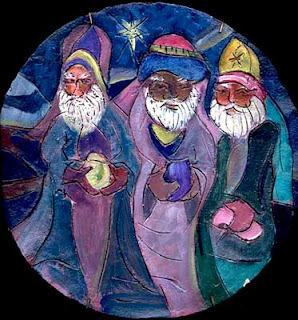 The Magi knew to follow a star in order to find the newborn child who would become a great king. The baby Jesus opened his eyes and beheld the most brilliant of starlit skies shining down on his humble birthplace. The Son of God was born literally with "stars in his eyes." No wonder the author of Revelation calls Jesus the "Morning Star." While pondering the scriptures enjoy listening to the Robert Shaw Chorale rendition of the hymn so long associated with this feast: We Three Kings. A Child is born to us. Hallelujah! A Child is born to us! It is amazing how much of ourselves that we unintentionally reveal in the course of ordinary conversation. Most of us don’­t have to talk very long before those who are listening have a fairly good fix on who we are and what we really value, even if our words themselves are intended to convey the exact opposite! Try listening to yourself some time. It can be both delightful and disconcerting. St. John the Apostle is a case in point. In today’s first reading, he reveals what he’s really about when he explains that he’s writing to his friends about Jesus so that “our own joy may be complete.” In a word, John thinks of his own happiness as something that comes from sharing life and giving it away, not just from grabbing what he can get. And that explains the whole course of his very long life. So where are you seeking your happiness? Are you finding it? Where have you invested your heart? Where do you invest most of your waking hours? Are you as happy as you’d like to be, or as you think you could be? What does that tell you about the course you’ve charted for yourself? We’re on the edge of a new year. It’s a good time to ponder our priorities and set them right. "Our thanks to you is great, dear Sisters, dear Brothers, for your humble, discreet, almost hidden presence in the eyes of men, but extraordinary and precious to the heart of God. To man often in search of happy, fleeting illusions, your witness of life says where true joy is found: in sharing, in giving, in loving with the same generosity of God that upends the logic of human selfishness." So there's a story told about a deacon in a church who wasn’t deaking. He just didn’t do what he was supposed to do as a deacon. One day the pastor said to the deacon, “I have a group of young people who go to the old folks home and put on a prayer service once a month. Would you drive them to the old folks home and at least do that?” The deacon agreed. The first Sunday the deacon was at the old folks home, he was in the back with his arms folded as the kids were doing their thing up front. All of a sudden, someone was tugging at his arm. He looked down, and there was this old man in a wheelchair. He took hold of the old man’s hand and the old man held his hand all during the service. The next month that was repeated. The man in the wheelchair came and held the hand of the deacon. The next month, the next month, and even the next month. The deacon went and there were tubes and wires hanging out all over the place. The deacon took the man’s hand and prayed that God would receive the man, that God would bring this man from this life into the next and give him eternal blessings. As soon as he finished the prayer, the old man squeezed the deacon’s hand and the deacon knew that he had been heard. He was so moved by this that tears began to run down his cheeks. Christmas works when we let Jesus take us into unfamiliar territory — a nursing home, a neighbor’s home, or into something even more bizarre, like an attitude adjustment, a generous spirit, a helping hand. Whatever. The point is that whenever and wherever we go, we are the hand of Jesus to others, and when that happens — Christmas happens. Because even in this darkest of nights, there is light. A Savior has been born for you who is Christ and Lord. He is our hope. A couple weeks ago I told the story of a Muslim woman in Iraq who – despite the great danger to her life — is converting to Christianity. She’ll be baptized a Catholic next Easter. That Muslim woman is living this gospel message. She is not afraid. 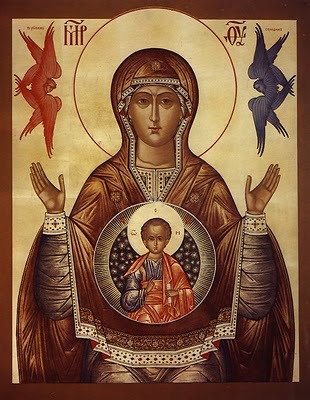 And she bears witness to this astonishing fact: the Incarnation continues. Christ is still coming to us. If God makes that possible, imagine what other miracles He has in store. 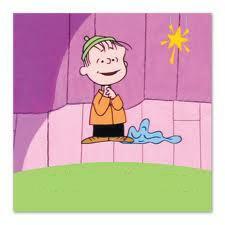 Yes: on this night, I proclaim to you good news of great joy that will be for all the people. A savior has been born. "As one newly born through God's personal choice, as a child born of God, the king embodies hope. On his shoulders the future rests. He is the bearer of the promise of peace. " "The greatest oxymoron of Christmas is that Jesus, the light and the joy that Isaiah foretold, was born into this world only to die for it. The light of the world was snuffed out on the cross. The lamb of God was sacrificed for our sake and for our salvation. But the light returned brighter than ever. The sacrificial lamb roared back to life as the lion of God, stronger than ever. Here is one final oxymoronic thought for you to take home this special day: The birth of Christ took place almost 2,000 years ago. The birth of Christ took place last night." "The Christmas mystery is about the incarnation of the Word made flesh, the Light sent into the darkness, the God who empties himself and becomes a man - so that, as the ancient Fathers taught, men might become as gods. " This past week our Marianist high school students visited the Little Sisters of the Poor and the elderly at Queen of Peace Residence. What a wonderful gift to be able to spend time with our friends in Queens Village. Whether it be sitting at a bedside or praying in the Chapel we received so much. In Christ, we have been gifted with the pathway to God, the route to fulfillment in life, the light which shines to illumine our steps toward God. As you search for presents for those you love, remember that the greatest presents of Christmas are not physical, but spiritual. In all your celebrations take this journey to Bethlehem and share these spiritual gifts of light, obedient preparation, wonder, excellence and the joy of truth. Did you now that God really loves you, and his affection has nothing to do with your education, your achievements, your job security, or even your bank account. In fact, the surprising insight of Mary’s song is that God “has looked with favor on the lowliness of his servant.” She announces that God favors us in our lowliness, in our humility, in our simple willingness to lean on him. That’s good news for all of us. When the world around us doesn’t seem to care, God favors us. When the future seems uncertain, God promises to do great things for us. Mary announces that God’s “mercy is for those who fear him from generation to generation” and that he will never let his people down. That’s image-breaking, expectation-shattering, radically reassuring. And it also happens to be true. But that’s not all. According to Mary, a Christmas cannot be limited to new insights into our personal relationship with God. It also has to include participation in what God is doing in the world. This means signing up to work with Mary’s son, Jesus, to bring down the powerful from their thrones, lift up the lowly and fill the hungry with good things. So part of our Christmas also has to involve taking our heads out of our holiday boxes and looking around. When the wrapping paper is cleaned up and the decorations are put away, we need to join Jesus in working for a better world, one in which the powerful are held accountable and the powerless are given support and opportunity. Jesus wants us to know that we are favored by God. But he also wants us to share that love and acceptance with others. Last week one of the Brothers invited us to consider the image of Our Lady of Advent. In the season of Advent, Mary calls us to prayer and meditation on the mystery of the Word made flesh within her. So often, Advent is a season characterized by rushing about, filled with hectic preparations for Christmas, as well as premature celebrations of the feast. It can be anything but reflective. This feast and this icon call us to imitate Mary who stands in silent contemplation of the mystery that is within her, and within us, Christ Jesus himself who came to dwell with us and will come again to take us to dwell with him. Mary "kept all these things, pondering them in her heart." Through the ages this has been Mary's role, calling us to prayer, to ponder these things in our hearts. It would make a good starting point for an Advent rule of devotional reading and meditation. "Mary belonged to that part of the people of Israel who in Jesus' time were waiting with heartfelt expectation for the Savior's coming. And from the words and acts recounted in the Gospel, we can see how she truly lived steeped in the prophets' words; she entirely expected the Lord's coming. She could not, however, have imagined how this coming would be brought about... The moment when the Archangel Gabriel entered her house and told her that the Lord, the Savior, wanted to take flesh in her, wanted to bring about his coming through her, must have been all the more surprising to her. 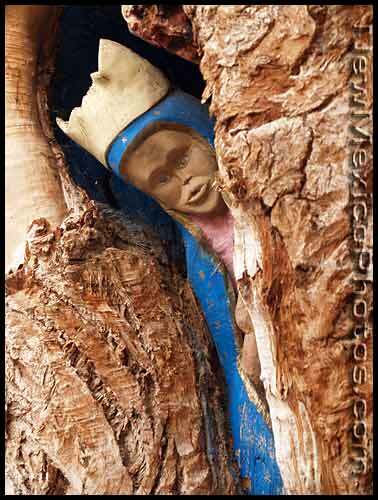 "We can imagine the Virgin's apprehension. Mary, with a tremendous act of faith and obedience, said "yes": "I am the servant of the Lord." And so it was that she became the "dwelling place" of the Lord, a true "temple" in the world and a "door" through which the Lord entered upon the earth." Like Mary, we must prepare our souls to be "fitting abodes for the Redeemer," a daunting task, indeed; but let us not be discouraged, for we may find consolation in the knowledge that Christ and His Mother accompany us on our journey. God is Light, and in Him there is no darkness. God spoke Light into the darkness. Light is life. Without Light there is no life. Darkness is death, the silence of God, the absence of God. Advent calls us out of the darkness to live in the light of Christ, to be the children of the Light that we are. “If we walk in the light, as He is in the light, we have fellowship with one another, and the blood of Jesus His Son cleanses us from all sin.” The night is over. The Day has dawned. Christ has risen from the dead. He has cast the bright beams of His light upon you. One of the highlights of our communal prayer at the Marianist Communities was the Advent season and the singing of the O Antiphons. The liturgy of the hours was simple yet powerful in its beauty, always focused deeply on the psalms and silence and intercessory prayer. The O Antiphons, which we sing during Advent embody all three characteristics: like the psalms, they give us a language to speak to God and with one another, at their heart the antiphons are profoundly intercessory: Come! Lord, come soon! 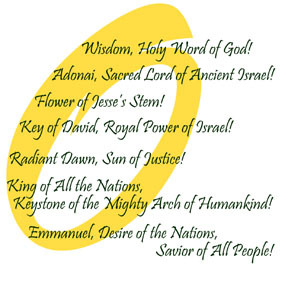 My favorite verse is always the fourth one, O Clavis David, O Key of David! (for December 20). Rather than being frightened by this image of Christ as the holder of the keys, the one who opens and no one can close and who closes and no one can open, the image of Christ as Key of David instills a far-reaching confidence. Our faith is carried on this promise of the One who holds all things in his life. I am reminded of the verse from John 3:27, “No one can receive anything except what has been given from heaven.” There is nothing that we have or could invent that might make Christ present but Christ comes and gives us everything through the Father and the Spirit… not only faith and all spiritual goods but all material goods as well. This image of Christ evokes adoration. We are totally dependent on this One who rules over all. And what a blessed dependence! For this One is described, not as the condemner or exterminator, but as the one who frees the prisoners, who calls out to the dead and leads them to life, who opens the eyes of the blind bringing them from darkness to light, whose heart is full of compassion and mercy, who is the Gospel coming to us in the forgiveness of sins and the restoration of community in God. 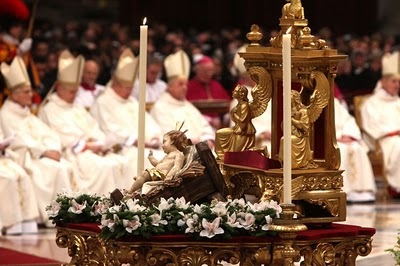 "…Advent is par excellence the spiritual season of hope. In it, the whole Church is called to become hope for herself and for the world…. …Our God is "the God who comes" and calls us to go to meet him. How? In the first place in prayer, that universal form of hope and expectation. The Advent cry of hope then expresses from the outset and very powerfully, the full gravity of our state, of our desperate need for salvation. Let us turn our gaze and our heart to Christ, in spiritual union with the Virgin Mary, Our Lady of Advent. Let us place our hand in hers and enter joyfully into this new time of grace that God gives as a gift to his Church for the good of all humanity. Like Mary and with her maternal help, let us make ourselves docile to the action of the Holy Spirit, so that the God of peace may sanctify us totally, and the Church become a sign and instrument of hope for all people. Amen. "O Root of Jesse, that stands for an ensign of the people, before whom the kings keep silence and unto whom the Gentiles shall make supplication: come, to deliver us, and tarry not." At 6:00 p.m. today the Marianist Community will gather for Liturgy of the Hours to sing Evening Prayer. The Magnificat antiphon for these days just prior to Christmas will be sung as well. Today's "O Antiphon" calls forth the prophecy of Isaiah, “But a shoot shall sprout from the stump of Jesse, and from his roots a bud shall blossom," and "On that day, the root of Jesse, set up as a signal for the nations, the Gentiles shall seek out, for his dwelling shall be glorious.” Spend a little time and listen to the chant. We remember that Jesse was the father of King David, and Micah had prophesied that the Messiah would be of the house and lineage of David and be born in David’s city, Bethlehem. Come, let nothing keep you from coming to our aid. Amen. On the scene today we meet this guy Joseph. Joseph we learn has a good construction job, betrothed to a teenager, Mary, and they’ve publicly declared their intention to marry. He’s a good guy, and you’ve got to wonder why he’s typically ignored in the retelling of the Christmas story. Even the donkey Mary rides on during their journey to Bethlehem gets more attention than Joe. Of course, he didn’t help his cause by failing to get advance reservations in Bethlehem, and could do no better for a night’s lodging for himself and his pregnant wife than a smelly stable out back. Mary gets the attention. But Joseph must have been crazy-happy that she’d even give him the time of day. He’s just an ordinary guy with modest prospects in love. And then his world falls apart, and when it does we realize that Joe is not average at all. Joseph welcomed Mary and her child into his life, and he invited God's Holy Spirit to work through all of them. Supportive roles, like Joseph's, are worthy of as much praise as are the "lead roles" in this life. and the gentle ways you guide all my days...Amen. “O Wisdom, O holy Word of God, you govern all creation with your strong yet tender care. Each day the Brothers gather together in the Community Chapel to sing the Liturgy of the Hours. Yesterday we began the special "O Antiphons" which begin and close the Magnificat. The antiphon is usually a verse which relates to the season or feast being celebrated. Among the most beautiful antiphons of all are those for the seven days (December 17 - December 23) leading up to Christmas Eve, each antiphon beginning with "O." In the book entitled Care of the Soul, Thomas Moore cites an old concept that should be rediscovered and celebrated by Christians everywhere this Advent. "Renaissance doctors," Moore states, "said that the essence of each person originates as a star in the heavens." This is very different, Moore continues, "from the modern view that a person is what he makes himself to be." What better time to rededicate ourselves to developing and nurturing our soul, our "starborn nature," than in this season of the Star. Our individual soul is a gift from the star of our origin the star that transmits the light of God's redeeming love down onto a darkened world. Our souls are seeds sown in us by Jesus, the Morning Star. Growing that seed-soul is the responsibility each one of us takes on when we commit ourselves to Christ. The Advent season is a time of decorating. During Advent we spend a great deal of time decorating - we decorate our shops, streets, homes, trees, sometimes even ourselves with an upbeat mood, unusual sprightliness and even an unfamiliar smile to strangers. There are two things to remember about these decorations. First, they are temporary. The tinsel, the trinkets, the lights come down and are stored away until next year. All too often with the dismantling goes the smile, the singing, the sprightly gait. Second, these decorations are exterior decorations - things seen, not unseen; things outside, not inside; things visible, superficial and artificial, not things of the spirit. The exterior decorations we rely on now to get us in the "Christmas spirit" often do remarkably little to alter the barren landscape of our souls. Red-nosed reindeer, spray-on snow and hosiery on the mantlepiece reveal little about our hearts. Indeed, they themselves can contribute to a culture filled with people without insides - all exterior, all appearance, all image. By contrast, God's exteriors always point in a substantive way to an interior reality. Luke's Gospel reminds us that there will be signs "in the sun, the moon, and the stars, and on the earth ..." - all of creation will reflect the stirrings of its Creator's intentions. On a simpler level Jesus points to a single fig tree which is capable of rightly expressing interior changes. Deep in its roots and heart, the rising sap of spring brings forth sprouts and leaves, decorating the tree with the lush greenery of new life. Jeremiah also uses this language of exterior regeneration to symbolize interior changes when he describes the new branch which will "spring up" from David's line. St. John of the Cross is one of the founders of the Discalced Carmelites and today is one of their principal feast days. I wish all my Discalced Carmelite friends a very happy feast day! "If you do not learn to deny yourself, you can make no progress in perfection." "Where there is no love, pour love in and you will draw love out." "In detachment, the spirit finds quiet and repose for coveting nothing." "To be taken with love for a soul, God does not look on its greatness, but the greatness of its humility." Now the dress rehearsal for a West Palm Beach, Florida, church’s Christmas pageant was interrupted Thursday night when a camel and its rider were thrown onto audience members, the Associated Press reports. Lula Bell, the camel, did not dip down into her seated position as planned, but rather stumbled and fell onto a number of spectators and her rider. In a Christmas miracle, no one was injured, including the camel. Unfortunately for Lula Bell, the First Baptist Church‘s pastor decided she won’t be appearing in any more shows. Advent: Rejoice in the Lord, always! Gaudete, in Domino semper! Rejoice in the Lord, always! These words that begin mass today, the third Sunday of Advent, give rise to the name “Gaudete Sunday”. Today is unusual in that it is one of only two Sundays of the year where the priest wears pink vestments. Purple is also a part of the black and blue of the healing injury, the bleed under the skin. It’s a good color to represent the people of Haiti this year who have received more than their fair share of life’s blows.Back to our camp. You have to try to imagine the 16 huge tents, spread out on gravel, extension chords bringing feeble power everywhere. Two washing machines under a tent, filled by buckets, dumping into a big dug hole, wash endless loads of sheets stained with deadly diarrhea. Twenty to thirty people a day are carried in, floppy bodies, by hook or by crook, even in these days of riots they somehow break through barricades. Rivers of Ringers Lactate flow through our endless tubing to revive them. Most do well. In fact, of almost 900 people who have come to us sick, only 15 have died of cholera. This is sad, yet we are encouraged that most people by far have fought and done well. None of our staff have contracted cholera after these many weeks of intense work, not have we tracked it into our St Damien or St Luke hospital. Still, our supplies run out, we can’t manage too much on site for emergencies, resuscitation, special medicines or tests, tension run high, tight nerves in strained doctors and patients make for a good bit of drudgery. But, we put Tang in our rehydration drinks, a Christmas tree and other lights try to make the nights a little festive, we have a big TV for those who are able to sit up and watch it and forget life for a while, and we try to keep everyone supplied with wonderful Christmas presents: a bar of soap, some toothpaste, a toothbrush, a towel. I mentioned in a previous message the many medical challenges: the pregnant woman with cholera, the baby born in a cholera tent, the patients with heart disease who need loads of fluid fast and whose hearts can’t handle it. We had another unusual challenge: a prisoner with cholera was brought at midnight. The police wanted us to handcuff him to his cot. We refused. It is cruel to cuff a sick patient to a hospital bed. Crueler still to chain someone with massive diarrhea to bed. So the police kept watch instead. During the following afternoon, the prisoner said to the police he had to go down to the toilettes, and off he went with his hospital gown and carrying his IV bag high in the air. And he kept going, and going...and that was that, right out the gate. He escaped in a hospital gown with his IV in hand. You have read of the riots these days. I spent two afternoons in the middle of them, driving around town picking up people we needed to help us. Imagine the problems riots bring in addition to being riots. You have 16 portable toilettes for cholera-diarrhea and the honey truck can’t pass through the streets to empty them. It’s not pretty. You doctors and nurses can’t get to work. Stores are closed for days, in case you need more toilette paper, soap, laundry detergent, food,Tang, or cash. The way we got around the city was something. I made an arrangement with 20 thugs, for a day’s pay. They were leaders in the riots in our part of the city. Three went ahead of my truck on motorcycles, and 17 rode with us in the back. We drove through the burning and barricaded city, while they pushed barricades out of the way and tangled with anyone who tried to stop us. It worked so well, I also did it the next day. It’s how we got essential staff to the hospital and the tents. Needless to say from the burning tires and debris we were covered with soot, so hard to get out that even after three showers we looked like we were wearing mascara. As if this weren’t trying enough, the skies turned gray for two days, and drizzled lightly, not enough to put out the fires but enough that our hundred of washed sheets wouldn't’dry. And when the sun finally did come out, so did small hornets, by the thousands, and they covered us. Sounds unbelievable, but it’s true. Ask Patty Rowland, who is back for a second round of 10 days to help at St Philomena. Yes, We still find the way. I trust you do too. Hope is the key, and it really does spring eternal. As always, count on our thanks and prayers, in exchange for yours. Thanks for the help that keeps us going and not doing too badly. Merry Christmas as it gets very near. Please pray for the repose of the soul of the mother of Father Garrett Long, S.M. "Keep watch," "stay awake," "be prepared" is Jesus' way of saying - don't "worry," "stew," or "fret" about what you cannot control. It seems with today's technology we almost have the world at our fingertips. We can contact someone almost anywhere with a call, a text, or even a twitter. It used to be if you were waiting for an important phone call, you had little choice but to sit by your phone all day waiting for it to ring. Then came "call forwarding," and you could program your phone to ring your anticipated call through to a different number. You could be in either of two places and still get your call. With a cordless phone, still more freedom of place was possible. You could go outside and still not miss the call you were waiting for. Finally, with the cellular phones and paging systems, spatial freedom is complete. By being properly prepared and equipped, you can go virtually anywhere and do virtually anything and still not miss that phone call. Any place can become every place. Jesus sort of encourages the "cellular-connected" Christians of their age. The on-time man working in the field and the on-time woman grinding grain at the mill looked just like their unprepared counterparts. They were busy laboring at their daily tasks, apparently wholly focused on the jobs they were doing. But they had a "cellular connection" to the Messiah, and when the Messiah called, they received the message and gladly took the invitation. To be cellular Christian today does not rely on any pricey piece of technology. The "cells" that must keep us attuned to Christ's frequency must be every cell of our bodies. If our bodies can become receivers, open to the vibrations of the Spirit, if our souls can amplify the signals we pick up and transmit them to all with we come in contact, then we have become cellular Christians who are living timely lives. Every Christmas, the time is ripe for meeting Christ anew. Don't fall asleep! Keep watch for his presence among us! The best way to prepare to celebrate Mass on the Lord's Day is to peruse and ponder the Scriptures we'll hear on Sunday. Here are the texts for this Sunday...they are but a page away - what are you waiting for? Prepare, Ponder and Pray the Scriptures of the Third Sunday of Advent. It is important to be authentic in today's world. Of course, today's advertising is not alone in seeing the appeal of authenticity. Companies everywhere are sensing that consumers gravitate towards products that appear to be true and genuine. For example, Starbucks is popular because it imitates authentic Italian espresso. BMW's taps into people’s natural desire for joy and freedom on the road. Organic foods are flying off the shelves because people sense that they are connected to farming practices that are healthy and good. Authenticity is hot. But how do you tell the difference between what is “really real” and what is “fake real”? How do you differentiate between a true espresso and a Starbucks? The authenticity question is raised because John the Baptist raises this issue while locked up in prison for offending King Herod. John sent his disciples to Jesus, and they asked him, “Are you the one who is to come, or are we to wait for another?” John needed to know if Jesus was a really real messiah, or a fake real messiah. The answer Jesus gives is fascinating. He doesn’t say “yes” or “no,” but suggests that they look around and make up their own minds. 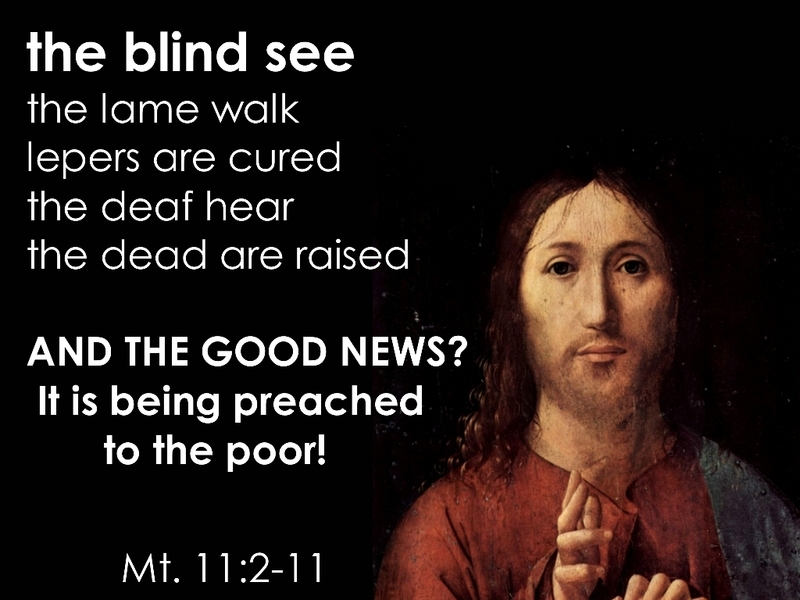 “Go and tell John what you hear and see,” says Jesus: “the blind receive their sight, the lame walk, the lepers are cleansed, the deaf hear, the dead are raised, and the poor have good news brought to them. And blessed is anyone who takes no offense at me." Look at what I am doing, Jesus suggests — then decide for yourself whether I am a really real Messiah. Authenticity is to be found in actions, not words — but rarely are people completely confident in the performance of their product. 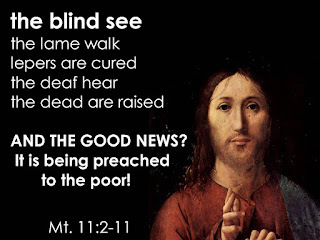 Look at what Jesus is doing here, not at what he is saying. He’s not just talking the talk; he’s walking the walk. His actions are proving that he’s really real, not fake real. He is the Authentic Messiah. “John Paul II named Our Lady of Guadalupe, or Our Lady of the Tepeyac Hill as the ‘Star of Evangelization.’ And the main thing for that title is what happened afterwards; so many conversions took place. Before that point there were only baptized infants, and also people who were dying who were baptized. Those in the middle could care less. They had some other pagan gods to worship, etc. 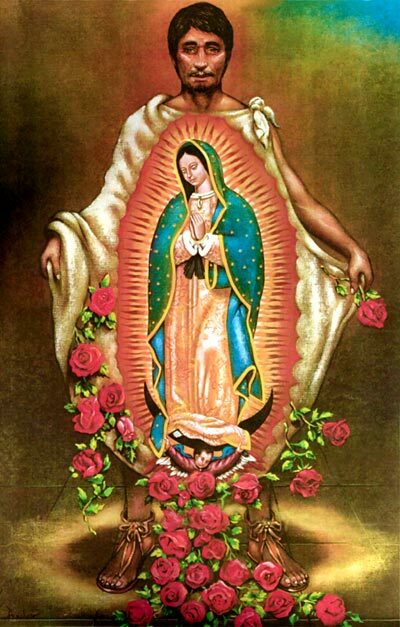 As I mentioned, today is the memorial of Saint Juan Diego. John Paul II canonized him in 2002 at the end of July. He is the first indigenous Saint of the American continent. He was baptized when he was fifty-one years old along with his maternal uncle, Juan Bernardino, which is where Brother Juan got his name after Juan Bernardino. Juan Diego was married, but his wife Maria Lucia died without leaving him children. But John Paul II described him as “The simple Indian who contemplated the sweet and serene face of Our Lady of Tepeyac.” He described him as a “just and upright man, a loyal son of the Church, docile to his pastors, a faithful disciple of Jesus, and one who deeply loved the Virgin.” That’s the words of our Holy Father John Paul II. I was so impressed by the humility of Juan Diego. Just the way he acted toward Our Lady and the way Our Lady spoke to him. The reason why Our Lady had chosen him was because of his humility. During this is a season of preparation we are flooded with images of moving from darkness to light, from slumber to awareness, but both negative and positive instructions. One would hope that as we prepare for the coming of the Christ child, we would understand how inappropriate these actions are for anyone who wishes to visit the manger at Bethlehem. Paul advocates a different approach — put on “the armor of light” and “the Lord Jesus Christ." In other words, Paul urges his readers to get prepared for a life lived in and for the kingdom, rather than to continue in the sins of the past. Rather than behaving in a way that sends out the signals of sin, Paul argues that we “put on the Lord Jesus” and thereby send out signals of righteousness. So, as we go into this Advent season, let’s give some serious thought to the signals we’re sending. The central figure for today is John the Baptist. He proclaimed, that “one who is more powerful” is on the way. So, he began to get himself ready. He moved to the wilderness. Lived with the animals. Ate grasshoppers. Dressed in itchy clothing. John the Baptist was hard-core. He learned there was - and is - a better way. Earnest disciples today do not consider the blood-and-guts approach of John the Baptist to be normal. Instead, we look to Jesus, the “author and perfecter of our faith,” and we “throw off everything that hinders and the sin that so easily entangles, and we run with perseverance the race marked out for us.” Jesus discipleship is humbling and counterintuitive. John the Baptist felt unworthy to assume even the most humble task of removing the sandals of Jesus, as was the custom in those days when dining socially. John teaches us that discipleship is not about us, not about the self, and that is so different. The focus is not on improving ourselves, enhancing our discernment, listening to our inner this or that. We are not traing for the gold, we are training for God. I hope your advent is off to a great start. If it is not, there still time to pull yourself together and make an effort. Today's advent meditation gives us a focus on what advent is all about. So, take a few moments and refocus your advent. Advent: The end is near? The first part of Advent is emphasizing the Second Coming of the Lord. The first Advent preface, used during the first part of Advent, recalls our Lord's first coming at His birth over two millennia ago, but more heavily stresses His Second Coming. We are told that the Son of God humbled Himself to come among us as a man. But as quickly as we remember the Christ who has already come, this prayer points to the Christ who will come again. For, we watch for the day, hoping that the salvation promised us will be ours when Christ our Lord will come again in His glory. By recalling the first coming of Christ, the coming that we will joyfully celebrate at Christmas, we gain confidence that Christ has not abandoned us but will come again. Yesterday and today we have had Martin Doman to assist at the Advent Prayer Services and XLT evening programs. He has been writing, performing, and ministering as a Catholic Musician for over fifteen years. Since graduating from Franciscan University of Steubenville in 1996, Martin has led worship for Steubenville's nationwide youth conferences, the Boston Catholic Men's and Women's Conferences, and many others. He continues to travel across the country speaking and performing at concerts and conferences. Martin has released six recordings of Catholic praise and worship music, and in 2002, Martin founded Christ MusicTM, a non-profit company dedicated to renewing the heart of the Church through Eucharistic praise and worship. Martin has been featured on the Catholic TV network EWTN as a guest on both the "Backstage" and "Life on the Rock" programs. He is currently employed as the Director of Praise and Worship Music Ministry at Ave Maria University near Naples, FL. Martin and his wife, Charlene have six beautiful children. Over 350 attended the evening of song and prayer. Students from the Marianist high schools even participated in the icebreakers and danced on the stage. But the highlight of the evening was during the final hour. During these final moments we experienced an Advent. This advent moment took place during the Adoration of the Blessed Sacrament where the Lord ever so clearly entered into our hearts. May the graces of advent continue to prepare us for the coming of Christ. Today we begin the Jewish Festival of Dedication, also known as the "Festival of Lights” or Hannukkah. It is an eight-day festival beginning on the 25th day of the Jewish month of Kislev, and this year it begins at sunset tonight. It is probably one of the best-known Jewish holidays because of its proximity to Christmas and therefore forming part of the "festive season." Hanukkah celebrates events which took place over 2,300 years ago in the land of Judea, which in many ways are linked to the Christian celebration of the birth of Jesus. Antiochus IV, the Greek ruler of the Seleucid Empire, oppressed the Jews severely. He placed a Hellenistic priest in the Temple, he massacred the people, he prohibiting the practice of the Jewish religion, and desecrated the Temple by requiring the sacrifice of pigs on the altar. One of the groups which opposed Antiochus was led by Mattathias the Hasmonean and his son Judah “The Hammer” Maccabee. This small band of pious Jews led guerrilla warfare against the Syrian army. Antiochus sent thousands of well-armed troops to crush the rebellion, but the Maccabees succeeded in driving the foreigners from their land. According to historical accounts, Jewish fighters entered Jerusalem in December 164 BC. The Holy Temple, the Jewish religious center, was a shambles, defiled and desecrated by foreign soldiers. The Maccabees cleansed the Temple and rededicated it on the twenty-fifth day of the month of Kislev. When it came time to re-light the Menorah, the multi-branched lampstand, they searched the entire Temple but only one small jar of oil bearing the pure seal of the High Priest could be found. Miraculously, the small jar of oil burned for eight days, until a new supply of oil could be brought. From then on, Jews everywhere have observed a holiday for eight days in honor of this historic victory and the miracle of the oil. The observance of Hanukkah features the lighting of a special Hanukkah menorah with eight branches plus a helper candle, adding a new candle each night. Does this festival however hold any significance for us? We know from the Gospel of John that Our Lord celebrated this feast in Jerusalem, but we are under no obligation or “law” to celebrate any of the Jewish festivals given to Israel. The feast however has obvious symbolism: Christ is the true light of the world and the events of Hanukkah are fulfilled in Him. In many ways the story of the Maccabees' success is a foreshadowing of Christ. The destruction and desecration of Israel is like the Fall. 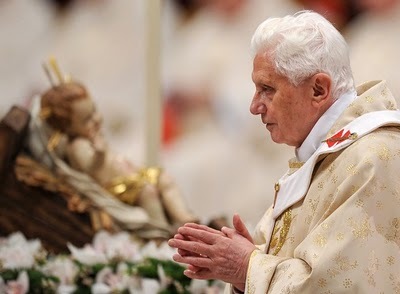 The light that restores the proper order in the Temple is brought by a miraculous and pure vessel, just as the immaculately conceived Virgin brought forth the Word Incarnate, who is the True light that will never cease to burn and shine in the world. As Christians, our Hanukkah is not only the re-dedication of the Temple but the re-dedication of creation by Jesus Christ. As we journey through Advent we prepare ourselves for this re-dedication which began when the Word became flesh.